If you were someone who viewed a news program, went online, listened to your car radio or (in a more retro mode), read your newspaper this morning you already know that one of the more breathlessly delivered headlines was about the aggressive nature of this season’s H3N2 influenza virus. One compelling story, perused in my paper copy of the New York Times (yes, I’m way, way retro) was about a doctor who recently treated a “manly” construction worker who arrived in her office burning with fever and curled into “the fetal position”. I liked this story because I’ve never lost my respect for the utter fearsomeness of this annual plague since the last time I caught it several years ago. It doesn’t always matter how strong and healthy you are – it will bring you low. It will storm your battlements and lay waste to your defenses. So please take the following information very seriously. As always, the Red Cross of Southeastern PA is looking out for you. 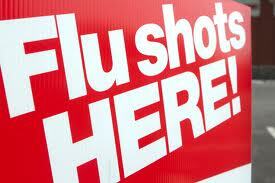 First, take steps to get a flu shot if you haven’t already. Go. Now. Walgreens. CVS. Your doctor. A clinic. So many options. . . These are important clues that it’s time to crawl into bed with a box of tissues, a nearby pitcher of water and a drinking vessel, some cough medicine and drops, some ibuprofen or acetaminophen (remember, no asprin for kids!) and the will to sleep for several days in between catching up on reading or TV . Please do this until you are fever free for 24 hours. For those who are at risk for complications such as the very old, the very young, pregnant women, asthmatics, and the immune-compromised, these individuals are encouraged to obtain an anti-viral medication such as Tamiflu or Relenza from a medical professional within 48 hours of the onset of their symptoms. These medications work to reduce the severity of symptoms and the likelihood of complications. It’s incredibly important for all flu sufferers to keep drinking water. Try using a straw if a sore throat is getting in the way. Fast breathing, trouble breathing or bluish skin color. Pain or pressure in the chest or abdomen (adults). Not drinking enough fluids, not being able to eat, or severe or persistent vomiting. Flu-like symptoms that improve but then return with fever and worse cough. Not waking up, being so irritable that the child does not want to be held or not interacting (children). Fever with a rash (children). No tears when crying or significantly fewer wet diapers than normal (children). If you are the caregiver for an elderly parent, a small child or “manly ” husband, there are several steps you can take to protect your household. It’s smart to designate a sick room and keep the sick individual away from other members of the family. Wipe down frequently used surfaces (bathroom doorknobs come to mind) with disinfectant. Clean dishes with hot water and soap and use regular laundry detergent for clothing. Wear gloves when cleaning up bodily fluids and used tissues. Better yet, put a small plastic bag inside a dust bin and deposit tissues there. Ideally, the sick family member should wear a mask when around others. Don’t forget, the first defense against influenza is careful hand washing. Keep scrubbing! More information about how to help protect loved ones during this flu season is available on redcross.org.